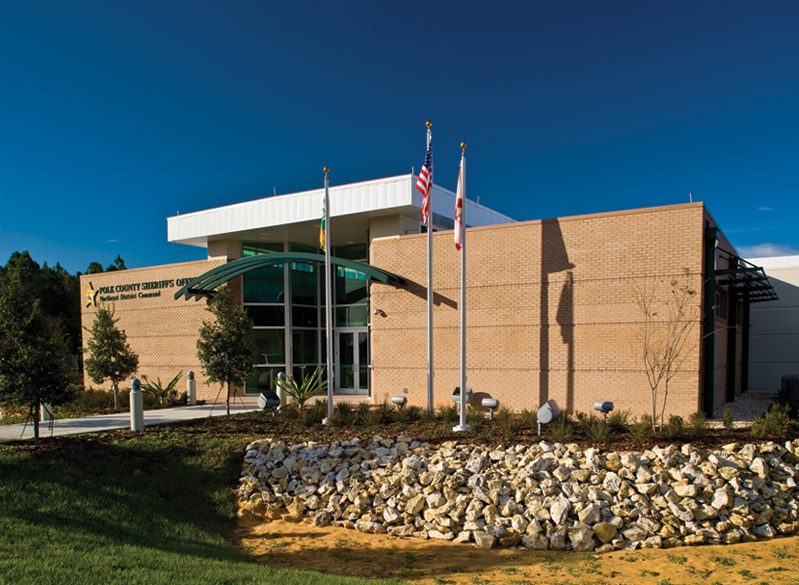 The Northeast District Command Center for the Polk County Sheriff’s Office utilizes a variety of design features that emphasize the Whole Building Design psycho-social value of space. Unique opportunities created solutions that resolved threat protection needs and the aesthetic challenges of linking the basic human needs and the environment. 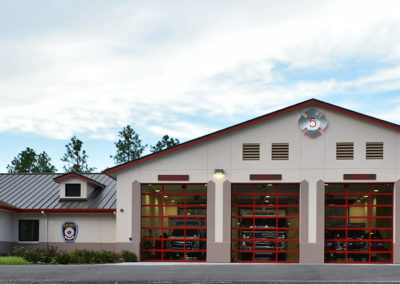 The project was delivered ahead of schedule and under budget, returning over $170,000 back to the owner at completion. Our design utilizes a variety of features that emphasizes the value of space as it relates to collaboration and inclusiveness. The needs addressed in the design include: Social Engagement, Collective Meaning, Relaxation, Information Sharing, Connection to nature, Sensory Variability, Aesthetic Integrity, Way-finding, Exercise and Sense of Equity. These needs are both for the public and the officers that make the command center their second home. 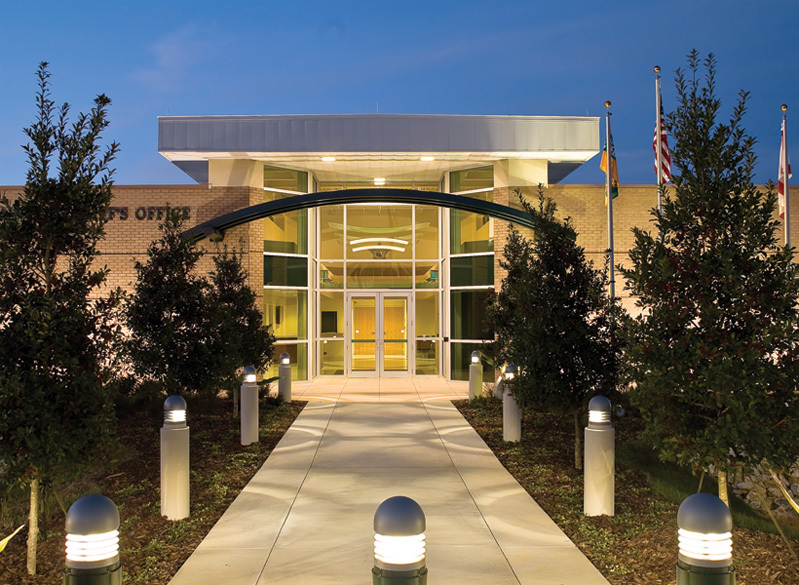 The aesthetic challenge to the exterior was balancing the security needs of the PCSO while remaining a welcoming and visually accessible building for the public. The design utilized a three tier force protection system addressing the varied attack probabilities with systems to counter the threats. 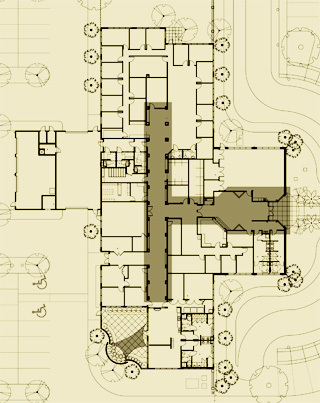 The site plan utilized the constraints of required retention and the grade as an asset as the first level of protection. 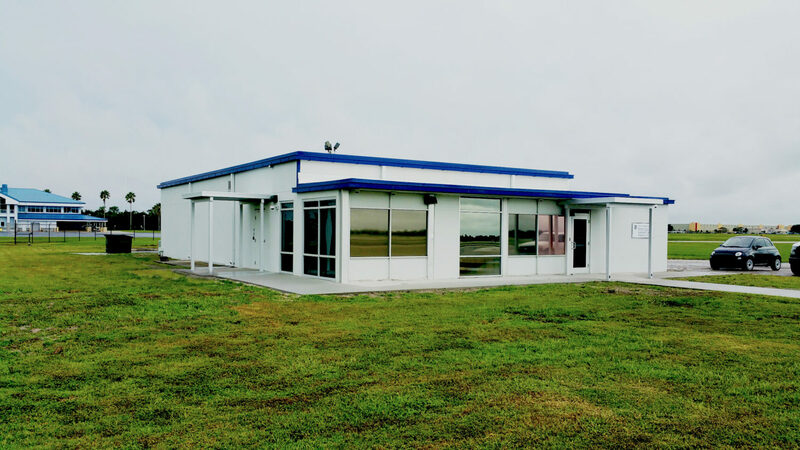 Though an innovative interdisciplinary concept of using the retention area and landscape elements as a vehicular containment and deflection system, walls and fencing were not required adjacent to the building. This allowed great visibility both from and to the structure. The building entry remains open and inviting while still providing the necessary separation of vehicles to structure without being visually blunt. The open entry provides for two of the links, social engagement of the public by visually drawing the visitor into the space and supporting the needs of wayfinding through strong visual cues. The building skin was used as the second tier of defense. The walls were tilt poured concrete. An additional level of cost savings was realized as the slabs were designed as the casting beds for the walls. All the glazing along the public front was designed as blast resistant. This allowed for the front entry to remain open and accessible to the public. All exterior windows except the entry were located 8’-0” above finished floor to maximize daylight without compromising the safety of those inside. The amount of daylight allowed in through these windows adds to the need of sensory variability. This need is further reinforced through the textures, patterns and colors of the space. 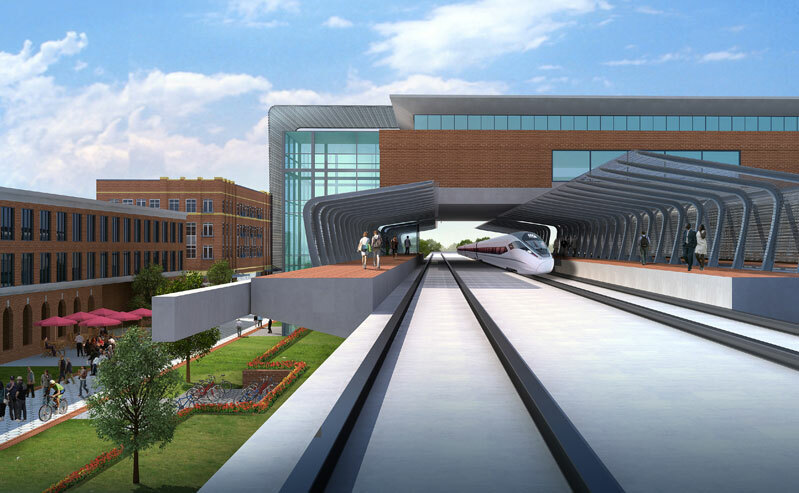 The final tier was creating a UL 752 rated envelope between the public and secured areas of the structure within the structure. The envelope appears seamless. By balancing threat protection and maintain the perceived openness of the entry, the structure provides for the health and well being of the occupants through the design of the spaces and allocation of amenities and successfully provides the sense of equity. 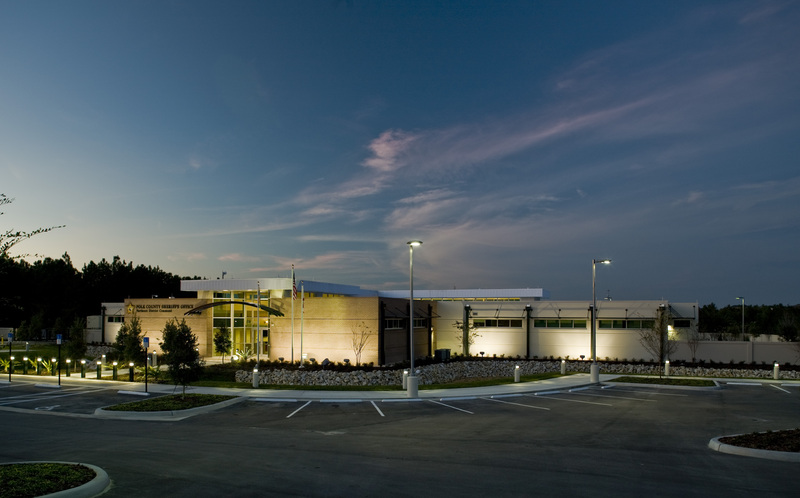 The building was designed to meet a LEED Silver standard, though it was not commissioned by Owner’s choice. 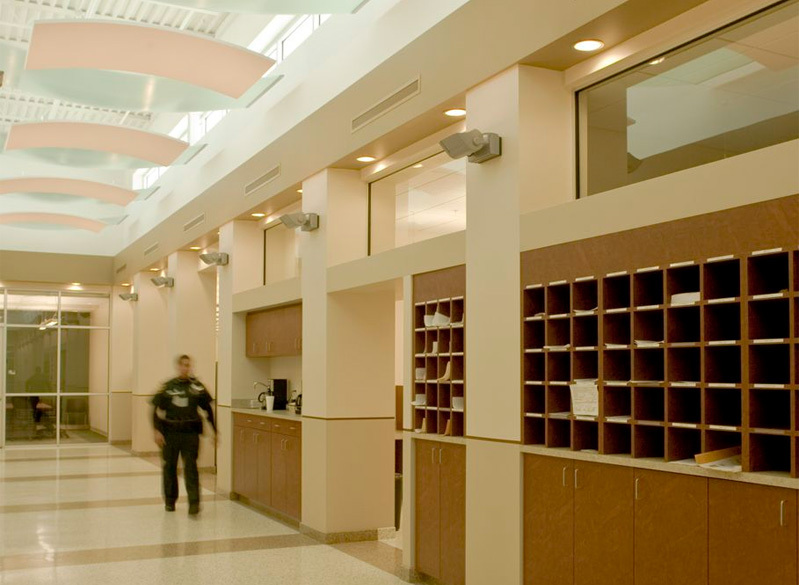 The central corridor of the command center acts as a boulevard of interaction connecting the east and west sides of the center. 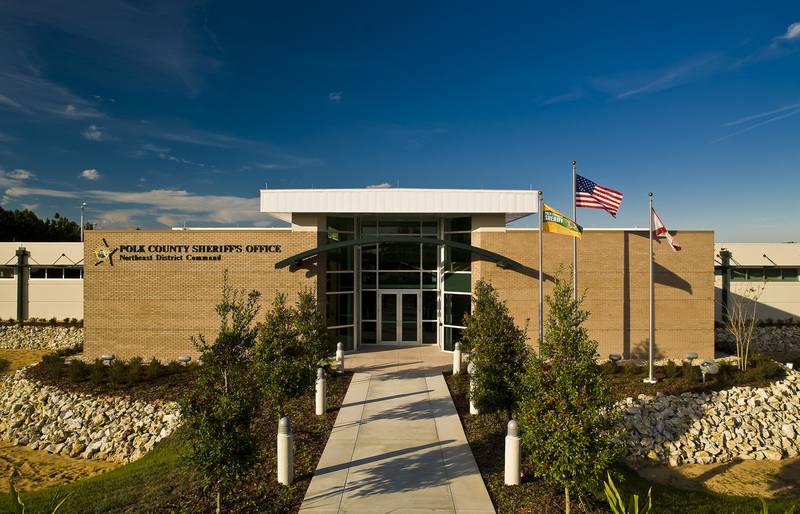 The corridor is widened so that activities such as mailroom, coffee bar, awards and recognition, and an informational kiosk for deputies coming into the center can be collocated and thus reduce required programmatic space. Embracing the spirit of collective meaning, social engagement and information sharing, this corridor is meant as an impromptu meeting area. The boulevard is anchored on the ends with a conference room adjacent to the offices on the western end and an exercise and locker room on the eastern end. The exercise room is flanked by floor to ceiling glass on the exterior wall that overlooks a protected courtyard. This interaction between courtyard and exercise and relaxation area provides a strong connection to nature and the outside. 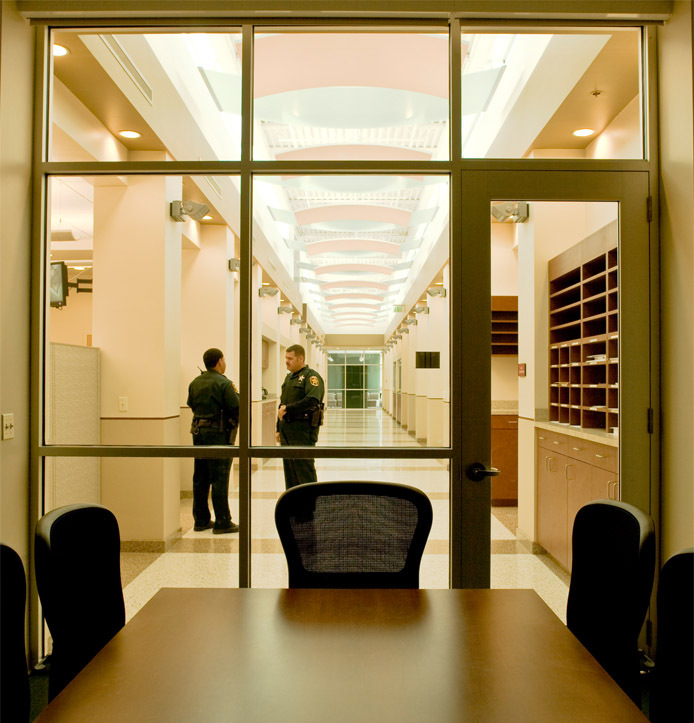 The briefing room is located near the rear entrance about half way along the boulevard for quick access from the rear entry and equal distance from either side of the corridor.The corridor is bisected by another high ceiling space along the south that connects the lobby to the deputy area of the command center. This creates a strong visual reference to the location of that main entry anywhere within that corridor. Clerestory windows run the entire length of the northern and southern sides of the corridor. The overhang is designed to minimize direct summer sun and maximize the low winter sun. The light spills into the corridor and is diffused by clouds hung in the space. The second purposes of the clouds is to bring a sense of human scale to the hallway. The clouds lower the perceived ceiling height thus the proportions maintain aesthetic integrity. The main purpose of these clerestory windows is to provide natural lighting into all of the interior spaces and achieve a sensory variability. The light is bounced into the internal offices through a set of borrowed lights and off of light shelves located along the corridor.